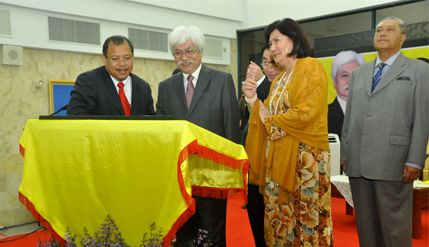 KUALA LUMPUR, 14 October 2014 – The National University of Malaysia Hospital (HUKM) has been named Canselor Tuanku Muhriz Hospital. Tuanku Muhriz Tuanku Munawir who is the Chancellor of UKM was present at the renaming ceremony today. Vice Chancellor Prof Datuk Dr Noor Azlan Ghazali who officiated the ceremony here said it is the first teaching hospital to be named after a royalty. The hospital had achieved several outstanding milestones in the field of medicine such as state of the art treatment and surgery as well as introducing Tissue Engineering a new treatment method. It has also carried out the revolutionary brain surgery where the patient remained conscious. It was performed by a specialist from its Neurology Unit. Other milestones include a new treatment method in treating skin damage and injury as well as deep brain stimulationsurgery to treat patients with Parkinson’s disease enabling a drastic reduction in symptoms of the disease and dependency of patients on medication. Present at the ceremony was Pro Chancellor Tun Ahmad Sarji Abdul Hamid, Chairman of UKM Board of Directors Prof Emeritus Dato’ Dr Mohamad Zawawi Ismail and senior members of the university management and students.